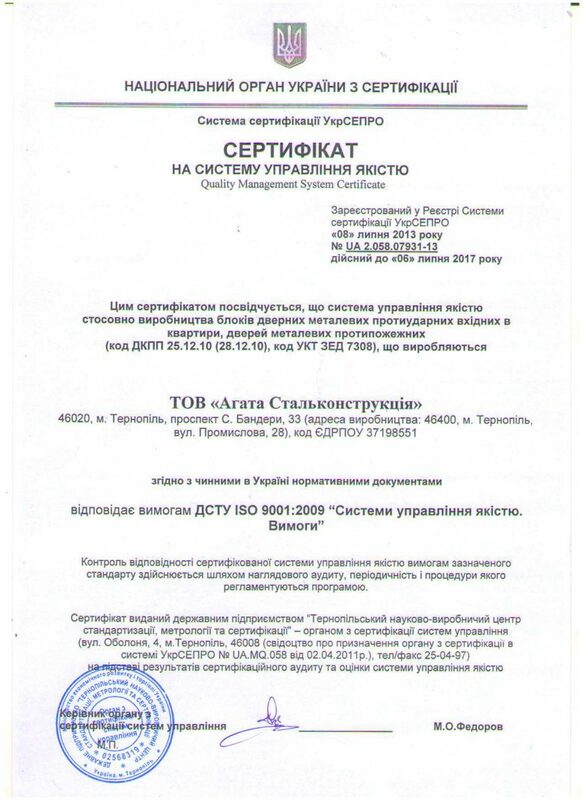 According to the Law of Ukraine “On Conformity Assessment”, on the basis of the results of the certification audit and assessment of the quality management system, this year AGATASTAL certificate was issued again. The conclusion was approved by experts of the state enterprise “Ternopil Scientific and Production Center of Standardization, Metrology and Certification”, in accordance with the normative documents in force in Ukraine. This certificate is a guarantee of product quality. It confirms the high level of security and proves that all stages of production have strict control. Consequently, the doors made by AGATASTAL are reliable, safe and environmentally clear .